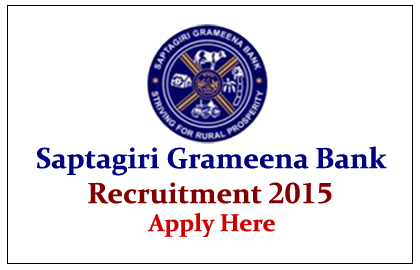 Saptagiri Grameena Bank has announced Recruitment Notification for the post of Officers and Office Assistant. Candidates those who have cleared the IBPS RRB CWE III which was held on Sep/Oct 2014 can apply here from 10th March 2015 to 25thMarch 2015. Eligible Candidates can apply online by clicking the link given below or through the Bank’s website:www.saptagirigrameenabank.in from 10.03.2015 to 25.03.2015.